A few weeks ago, my veggie garden had a major eggplant explosion. Of course, that was back when it rained regularly and the things growing in my garden didn’t depend solely upon me for water. It hasn’t rained in like 6 weeks so things are a little quieter in the garden these days. 1) I grilled it. Like, all of it. 2) And then I put it on pizza for dinner and opened a bottle of wine. 3) And then I put it on a tortilla for lunch and called it a tortilla pizza but I didn’t open a bottle of wine because I hear that is frowned upon. I have made this pizza for dinner no less than 5 times. And I’ve probably had the tortilla pizza-version for lunch as many times. NEVER GETS OLD. Putting grilled eggplant in/on everything was nearly as fun as that whole fig thing. 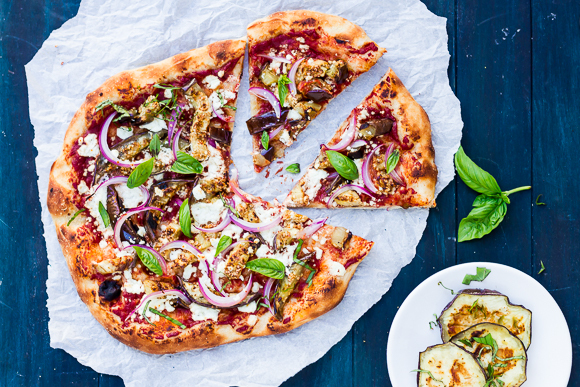 Smokey grilled eggplant and tangy goat cheese make a wonderful summer pizza topper. Heat your grill to medium high and lightly oil a grill pan or a double-layer of foil. Slice the eggplant into ~1/3-inch slices. Put the eggplant slices on a rack set in the sink (or over a baking pan if your sink is almost always full like mine) and generously salt one side of the egg plant slices. Let sit for 15 minutes. Flip the eggplant, salt the other side, and let sit another 15 minutes. Transfer the eggplant to a double-layer of paper towels and with another double-layer of paper towels, press down to remove any extra liquid. Use the paper towels to wipe away any excess salt remaining. Transfer slices to the prepared foil/grill pan and put on the grill, flipping after ~6 minutes (or when slices have nicely browned). Let slices cool just a bit and then slice into strips. 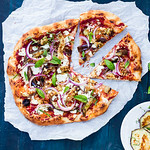 To make the pizza, stretch each dough ball to desired crust thickness, spread 1/3 of the marinara over top and then top with eggplant, red onion slices, and crumbled goat cheese. 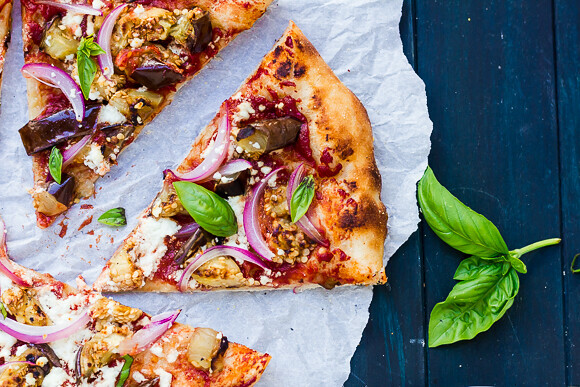 Bake until the crust is nicely browned, remove from oven, and serve topped with fresh basil leaves. (For a full run-down on exactly how I make pizza at home - temp, time, method, etc, read this. In Europe, wine with lunch is TOTALLY reasonable…so why not here?! 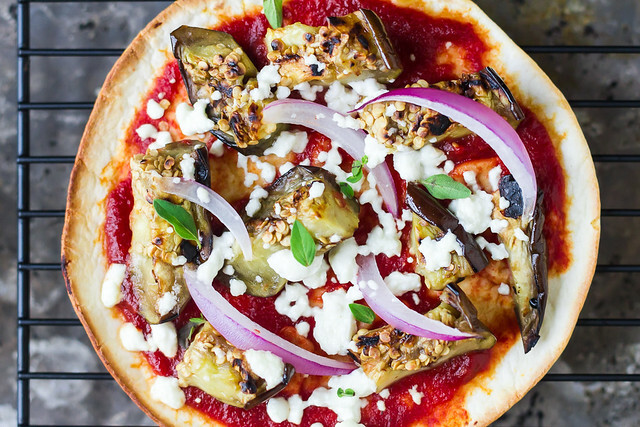 We are getting loads of eggplant in our CSA and I know we would love it on this pizza! Oh my goodness eggplant and goats cheese are like a match made in heaven! And on homemade pizza crust.. looks divine! !